Will from the Chronograf team here! We’ve been hard at work and are excited to introduce our next major feature: dashboards. Also part of this release are major UI/UX improvements, and improvements to the data exploration and query building experience. If you’re new to Chronograf, it’s a data visualization tool built specifically for InfluxDB. As a team, our goal is to build a product that is feature-rich, but also accessible. A tool for both developers AND non-developers. Using Chronograf should be seamless and intuitive, all the way from initially connecting to your InfluxDB instance to building meaningful visualizations. How quickly we can go from “zero to graphs” is one of our most important metrics. Graphs being persisted separately from dashboards also gives you the ability to easily add a single graph to multiple dashboards. 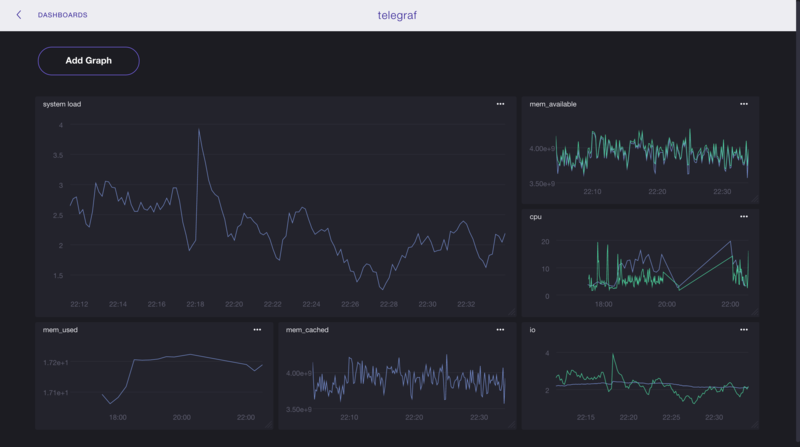 Note: In these examples, I’m building a dashboard for system metrics using data gathered by Telegraf, a plugin-driven server agent for reporting metrics into InfluxDB. The larger your datasets become, the more important it becomes to have effective tools to navigate and explore your measurements and tags. Chronograf’s query builder is smart: selecting a measurement will mean only tags linked to that measurement will be available to choose, and vice versa. Want to try it out? Chronograf is free to use, and without user or per server limits. You can download Chronograf here. We’re still in active development and are eager to hear what you think! Contact the team at [email protected].